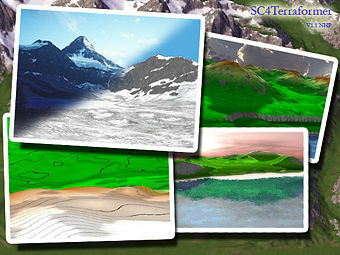 The SC4 Terraformer is standalone application created by Wouanagaine that allows you to create and edit SimCity 4 regions. No more open, terraform, save, open, reconcile, terraform, save, etc. You can choose to create a region from scratch and hand terraform it or you can open an existing region from your regions folder and make changes to it as you please. All the hand terraforming tools from SC4 are now available for your use on an entire region. Other tools have been added to help your hand terraforming become an easier job. SC4TF saves your region in a proprietary file called .SC4M that saves the data from your region to a precision of 0.1m in elevation. With a regular image you only have a precision of 2.4m. Another advantage to this tool is instead of using CTL+ALT+SHIFT+R and waiting 30 minutes, an hour or even more for a region to load it is a two click step. This program is entirely 3-D and allows you to move around and view your region from any angle imaginable. You can take pictures from a bird's eye view or at eye level. This page was last modified on 25 February 2012, at 20:03.